Sometimes all it takes is a gallon of paint. 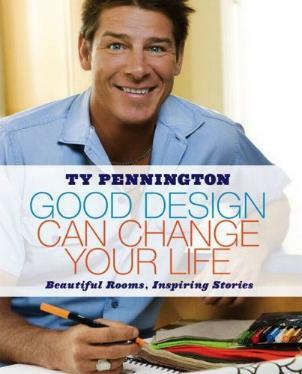 Ty's new book about change in your home is spot on. Little changes are often all that is needed to lift your spirits or change the atmosphere in your home. Not everyone can completely re-do their homes — you don't have to — so anyone wanting to brighten their lives, and homes, could use this book. And you don't have to be a craft person; Ty's changes are do-able. He covers bedrooms, living spaces, and work spaces, and he lets us into a few secrets he used on his phenomenal TV show, Extreme Makeover: Home Edition. I loved this sentence, which sums up his book: "No matter that you can't afford the Taj Mahal; you can have the Garage Mahal!" A little goes a long way. Now, Ty might seem a bit of a scatterbrain, but he really does think things out, and gives us twelve steps to consider before diving in and making changes around the home. He discusses color, style, furniture, accessories, inspirations, lighting, motifs, flow, and pop. All throughout the book he's given examples of how he put things together. I loved the black and white (with a splash of color) bedrooms, even though I love color. Who knew! Ty's asking us to open our eyes and to "see" our worlds about us, and then to incorporate bits and pieces in our homes. He's brought so many kids' fantasies to the fore - see the bedrooms on pages 129 (mind-blowing) and 121. Ty's work is not over-the-top or outrageous, despite his unrestrained personality. I also love that very often he incorporates a touch of nature, especially by his use of wood. There are many ideas you can make your own in this book. It seems there is no end to this gifted and fun man's talents and heart. Conclusion - I loved Ty's breath of fresh air approach to design and decor. He's a force to be reckoned with.